Recently, Ubiquiti Network Switch is of prevalence for building and expanding home network. EdgeSwitch and Unifi Switch are two main switch series of the Ubiquiti Network Switch. For years, the EdgeSwitch and Unifi Switch are featured as cost-effective, robust performance, and this is why many people have special favor on them. For they both a good choice for growing networks, it is necessary to make clear their differences and decide which one to choose. In this article, we will mainly introduce the EdgeSwitch vs Unifi Switch, similarities and differences as well as compatible SFP transceivers for them. The Unifi Switches provide 8, 16, 24, or 48 PoE Gigabit Ethernet ports to satisfy different requirement for expanding Gigabit Ethernet network and making your network cabling looks neat. They support IEEE 802.3af and IEEE 802.3at. And the operation is rather easy, you can directly connect your switch to a storage server through two SFP ports on each switch. The transmission rate can be up to 1 Gbps. For longer distance and higher bandwidth, you can use Unifi Switch with 48-port which additional added two more SFP+ port. The following picture shows a basic parameter of all the Unifi Switches models. As same as Unifi Switch, the EdgeSwitch have the same PoE Gigabit Ethernet ports and IEEE protocols. The most distinctive feature of Edgeswitch is that offers an extensive suite of advanced Layer-2 switching features and protocols, and also provides Layer-3 routing capability. There are 6 EdgeSwitch models, the accurate ports’ number are clearly shown in the below chart. You can use ES-8-150W, ES-16-150W and ES-24-250W as well as ES-24-500W switch models to achieve 1G Ethernet network connectivity. SFP+ transceivers, you can choose ES-48-500W, ES-48-750W to arrive 10 Gbps connection. Both Unifi Switch and EdgeSwitch have 8, 16, 24, or 48 PoE Gigabit Ethernet ports. As for edgeswitch vs unifi switch, the two switches basically share the identical switch type (switch ports and Watts), the only difference lies in the EdgeSwitch does not have one with 8 ports for 60W. The Unifi Switch and EdgeSwitch both support IEEE 802.3af and IEEE 802.3at. They are both support 1G and 10G Ethernet connection and have both SFP and SFP+ ports. The EdgeSwitch is black while the Unifi Switch is silver. The Unifi Switch can only be managed through the UniFi controller while the EdgeSwitch can only be managed through it’s CLI or web interface. The EdgeSwitches only support static routing, and there are no routing protocols implemented while Unifi Switches don’t support routing at all. 1000Base-LX: SFP1G-LX-31 1310nm (Single Mode SFPs). Ubiquiti Network Switch seems to be an irresistible trend for home network connectivity. Through this passage, we learned that EdgeSwitch vs Unifi switch and are different in color, management and routing protocols. If you are looking for compatible SFP transceivers for those two kinds of the switch, you can take FS.COM a try. In addition to SFP transceivers, we still offer many other optical products, such as patch cables, SFP+, QSFP and QSFP28 optical modules, network cables, switches, etc. If you are interested, you can visit www.fs.com. Due to more and more internet users, the new applications become more various, such as Storage network, Internet data center, CAD/CAM, Multimedia and video order programs, Telemedicine, Distance learning course and other applications, all these applications need a lot of bandwidth. It is quite strict to the bandwidth of MAN and access network at the first kilometer. High speed data transmission means that the speed of a PC or server LAN ports needs to be improved to meet the new applications. 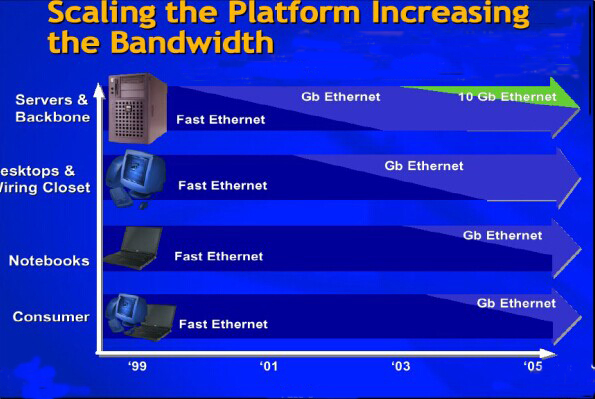 At the same time, because of the rapid developments of semiconductor, 1000Base-T Gigabit Ethernet instantly become a boom. Once we talk about 1000Base-T Gigabit Ethernet(also called IEEE 802.3ab), is a standard for Gigabit Ethernet over copper wiring. Each 1000BASE-T network segment can be a maximum length of 100 meters (330 feet) and must use category 5 cables or better (including Cat 5e and Cat 6). 10Base-T and 100Base-T are required to be mentioned, 100 Base-T, also Fast Ethernet, is simply 10Base-T running at 10 times the bit rate. Related product: 10/100/1000BASE-T Ethernet SFP. Since we know that 100Base-TX standards are compatible with 10Base-TX networks, the Fast Ethernet can make 10 Mbps and 100 Mbps bit rates on the line. Nodes with 100Mbps capabilities can communicate at 100 Mbps, and they also can communicate with slower nodes at 10 Mbps, so Fast Ethernet is the natural process of standard Ethernet, and then make the existing ethernet to be easily updated. As an extension of standard Ethernet technologies to gigabit-level network speeds, 1000BASE-T is normally implemented using the commonly installed category 5 cabling or enhanced category 5 cabling version of UTP cabling (for example, category 5e). Unlike using only two pairs of wires in 10BASE-T and 100BASE-T networks, 1000BASE-T uses all four cable pairs for simultaneous transmission in both directions through the use of adaptive equalization and a five-level pulse amplitude modulation (PAM-5) technique. In the process of transmitting a 1000 Mb/s data stream over four pairs of Category 5 twisted pair cables, there are certain associated problems caused by factors as attenuation, crosstalk, and echoes arising from full-duplex transmission over single wires. To solve these problems, special filters, the PAM-5, forward error correction techniques and pulse shaping technologies are specified to make 1000BASE-T a functional and reliable networking technology. The special filters are for hybrid circuits used in full-duplex transmission over single wires. The PAM-5 provides better bandwidth utilization than binary signaling. Forward error correction techniques provide a second level of coding that helps to recover the transmitted symbols in the presence of high noise and crosstalk. Pulse shaping technologies match the spectral characteristics of the transmitted signals to those of the channel in order to maximize the signal-tonoise ratio. Nowadays the 10 Gigabit Ethernet Alliance has been held in order to promote and accelerate the introduction of 10 Gigabit Ethernet into the fiber optic networking market. It was built by fiber optic networking industry leaders, such as 3COM, Cisco Systems, Extreme Network, Intel, Nortel Networks and other famous companies. Related product: Cisco GLC-T 1000BASE-T. Additionally, the alliance support the activities of IEEE 802.3 Ethernet committees, more force the development of the 802.3 ae (10 Gigabit Ethernet) standard, and promote interoperability among 10 Gigabit Ethernet products. The IEEE standards association unanimously approved the IEEE 802.3ae specification for 10 Gigabit Ethernet as an IEEE standard. I believe that in the near future, Ethernet will have a more comprehensive development as with continuous improvement of the system.